The EasyCart checkout system is designed to work with in over 30+ gateways and shipping systems. There are many settings allowing you to enable/disable features during checkout so that the workflow will meet your business needs. This is an integral and complex part of the shopping cart. You may enable and disable certain form fields and features that appear during checkout in the billing/shipping/confirmation pages. Force Site Secure (SSL Certificate Required): This setting will make your entire site use https:// and go secure. You must have a valid SSL on your web hosting in order to work correctly. Your web host will install an SSL for you, once it is installed, every site should turn this option ON as most payment gateways will not work unless you are running a secured website. Display country Selection at top of form: You can decide if you want country to be the first field/selection on the billing/shipping page or not. We recommend you have this first because it can change the state/province list depending on what country is selected along with various language headers. If not selected, country will appear near the bottom of the form after they enter their city, state, zip code. Enable Address Line 2: You can enable this 2nd address line if you have businesses which offer 2 line addresses. Some customers choose to enable this 2nd address line and re-label it using our language editor to collect business name or other data. Enable Phone Number: Choose whether you wish to collect the users phone number or not. Enable Company Address: Choose whether you wish to collect the company name and address. Enable VAT registration number: If enabled, you can allow the user to enter a VAT registration number for collection during billing/shipping address input. This is required in some countries. Enable Customer Notes: If enabled, during checkout on the confirmation page there is the ability for customers to leave any notes or comments they wish you the business owner to see. Enable name for account: If enabled, a users first and last name will be collected during account creation. This could be different than the billing/shipping address coming from companies and such, so the name collection can be more personalized to the user and the account. If not enabled, only a password is required for account creation. Collect Card Holder Name: If enabled, the users card holder name will be collected during credit card transactions using live payment gateways. This is usually not a requirement for the card processing companies, but can be helpful if passed. 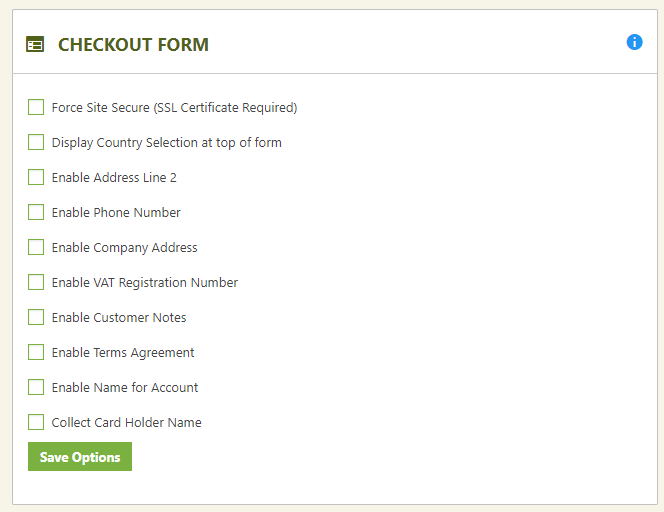 These options allow you to define further how the checkout process will work in your ecommerce store. Terms URL: We highly recommend you build a terms & conditions page in wordpress and put the url in this location. It will appear in the terms agreement statement for users to click on and agree to before order confirmation. Custom Return to Cart URL: By default, this is empty and your continue shopping button will return users to the store. IF you want to enter a custom URL here, then all of your users will see the continue shopping button go to a this custom set url. Weight Unit: LBS or KGS can be selected to represent your weight units. The units are actually only represented in live shipping API systems during package calculations and not displayed to users in most situations. Units of Measurement: STANDARD or METRIC may be selected for units during package calculation and also for within some advanced option sets that calculate measurement. Default Payment Selection: You can choose which payment method is selected during checkout by default. You could possibly have manual payments, third party payments, and live payments all enabled, giving your customers a default is a good choice. Default Country Selection: During billing/shipping completion, the customer could have a default country selected, making checkout easier given the country is already on the most common method. 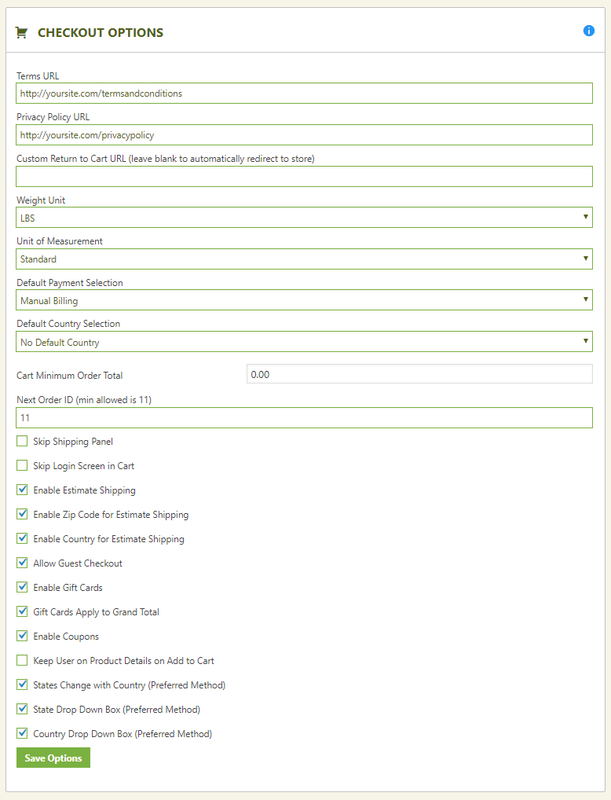 Cart Minimum Order Total: Set a value here will require the user to meet this threshold during checkout before they may proceed to placing the order. Next Order ID: The order ID is an auto increment value in the database, and you may adjust this integer value to a value greater than what is already set. You may not go lower as the order IDs may run into inconsistency with existing data. Skip Shipping Panel: Depending on your shipping method, it may not be necessary for customers to see the shipping panel after billing/shipping address. Using trigger shipping is a good example of when you do not need to show the shipping panel, as it’s already calculated. Skip Login Screen In Cart: You can choose to skip the login panel within the shopping cart and have customers simply enter their data and checkout. Enable Estimate Shipping: The shopping cart lets your customers estimate shipping. Using live shipping is a good example of when a customer could enter their zip code and get estimated shipping. If using trigger based shipping, there is no need for estimates as it automatically calculates and finds correct value, so this section could easily be turned off. Enable Zip Code for Estimate Shipping: If enabled, the user can enter their zip code to estimate shipping. Enable Country for Estimate Shipping: If enabled, the user can select their country to estimate shipping. Allow Guest Checkout: If enabled, you can let users bypass entering a password and saving their account data. The only difference between a guest checkout and a regular checkout is the addition of a password to save their account information. IF selling things such as digital downloads, customers are required to have an account to access their purchased goods. Enable Gift Cards: During checkout, customers may redeem gift cards by entering their gift card ID. You may disable this section if you do not have or sell gift cards using EasyCart. Gift Cards Apply to Grand Total: If using EasyCart gift cards, you can apply them to the cart total, or the grand total. By disabling, only the cart total will be used, with shipping and taxes still applying to the order. If checked, the entire gift card may go toward the cart, shipping, taxes, etc. Enable Coupons: During checkout, customers may enter coupons to ro redeem. You may disable this section if you do not have or utilize coupons within EasyCart. Keep user on Product Details on Add to Cart: When a user adds an item to the shopping cart from the store, does the user simply stay on that product page, or do you want them to jump to the cart page and view their entire shopping cart. This section determines what happens when you monitor and track inventory stock levels and how EasyCart should handle that data. Send Low Stock Admin Emails: If enabled, and you are controlling inventory at the product level with quantities and inventory levels, an email may be dispatched to admin users when the low stock quantity trigger is met. 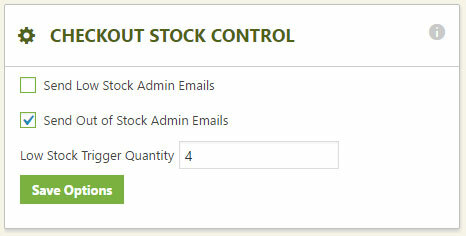 Send Out of Stock Admin Emails: If enabled, and you are controlling inventory at the product level with quantities and inventory levels, an email may be dispatched to the admin user when the stock quantity drops to zero. Low Stock Trigger Quantity: This sets the low stock quantity trigger for emails to be dispatched.